In her heyday, Hollywood in the Roaring Twenties, they called Mae Murray the Girl with the Bee-Stung Lips or the Ziegfeldian Nazimova. When she clung to the memories of her fame later in life, they compared her to Norma Desmond or Baby Jane Hudson. Mae Murray was everything a movie queen in the days of silent films was expected to be: extravagant, vain, egotistical, and temperamental. You had to look no further than Murray to see the quintessential 1920s femme fatale with her blonde tousled mane, heavy-lidded eyes, crimson lips, and a dancer’s body displayed in shimmering gowns or hidden in ermine. A master at self-promotion, her eccentricities were shocking to her contemporaries and made her one of the most controversial actresses of her generation. Born in the late nineteenth century in Manhattan’s Lower East Side, Murray escaped a childhood marred by poverty and alcoholism, divorced her family, and was reborn in the footlights of Ziegfeld’s Follies of 1908,1909, and 1915. One of the first Ziegfeld stars to abandon the stage for the screen, Mae came to Hollywood, where she eventually married her director, Robert Z. Leonard. Together, the pair made a string of successful, sophisticated comedies that allowed Murray to dance in high style. Critics dismissed her acting as a series of poses and close-ups. When the Leonards divorced 1925, Murray came under the direction of the volatile Erich von Stroheim in The Merry Widow. While they fought incessantly throughout the production, the director showcased Murray at her finest. At the height of her fame, Mae walked out on M-G-M, married one of the “marrying Mdivani” princes, and fled to Paris, where, under a shroud of secrecy, she became a mother. Finding herself blackballed in Hollywood by mogul Louis B. Mayer, Murray struck out on a vaudeville tour before being lured into talking films. By the time Murray divorced David Mdivani in 1933, her $3 million fortune was little more than pennies. Exhausted and weary after countless legal battles and one-night stands on the road, a bankrupt Murray gave up her son and slept on a park bench in New York’s Central Park. A sensational court battle to reclaim her child ended when the boy chose to remain with his guardians. Heartbroken, Murray spent the rest of her life chasing a comeback and lost in her own imaginary world of self enchantment and delusion. About a year before her death in 1965, a dazed and confused Murray was found wandering the streets of St. Louis, Missouri. Mae Murray’s 1959 authorized biography, The Self-Enchanted, told the fanciful story Murray wanted people to believe. Michael G. Ankerich’s riveting biography, exhaustively researched, reveals the shocking life she actually lived. 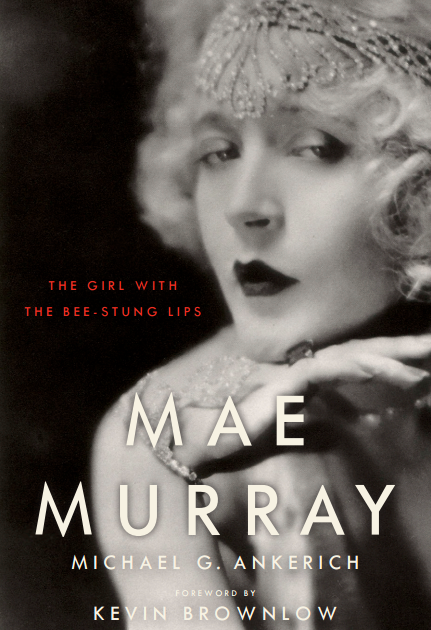 Mae Murray: The Girl with the Bee-Stung Lips provides a thorough examination of her career and sheds light on her four failed marriages and the family she never wanted to acknowledge. For the first time, her son goes on record to discuss the mother who denied him the truth around his mysterious birth. Murray’s descendents and friends reveal personal details that bring the spotlight back to one of the most enigmatic icons of the silent screen. Reading Mr. Brownlow’s introduction makes me with that the book was available now. I am getting a (good) feeling that Michael has uncovered much about Mae that was never known before. I can not wait to read this book. I just found Mr. Ankerich’s website and I am hooked. I love the Silent Screen stars and early hollywood. Got my pre-order in for my Ipad (yes, I love, love, LOVE ebooks! ), and this one is going to be my x-mas present to myself. I promise I won’t read anything until the 25th. Promise! A very accurate account of Mae Murray’s life without glossing over any of the details.